The autopsy shows that Scott was shot with a taser dart and received significant blunt force trauma prior to his death. Not many people can pose much of a threat to anything after being hit with a taser. Witnesses report hearing 4 to 5 shots. The entire event smells like overkill. The reactionary position is predictable. “Why take the side of a kid who engaged in a car chase with the police over that of an officer? Clearly he was up to no good.” The implication is that if you break the law, you deserve whatever you get. That sort of mentality has no place in a nation of laws. We don’t have the death penalty for traffic infractions, and we generally prefer judgements to be passed by juries. What does seem clear to me is that even if Dane Scott Jr. had a gun, even if he ran from the police, even if he was a 60-year-old felon with a rap sheet a mile long rather than a teenager engaged in criminal mischief, none of those things should warrant a death sentence. 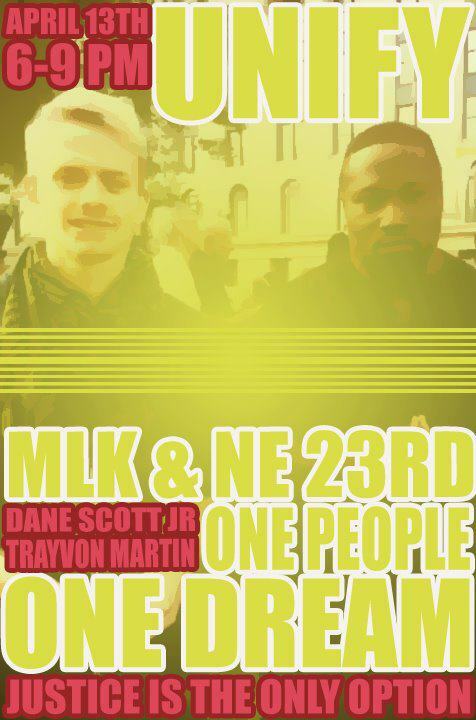 Community activists will gather tonight at 6pm at 23rd and MLK to protest the shooting. Tagged community, criminal, cs, Dane Scott Jr, Del City Police, Del City Police Department, Del City Police Department Captain Jody Suit, James Edward, MLK. Bookmark the permalink. What?!? So, if he had a deadly weapon while displaying the intent to use it, the officers can’t respond in kind? I’m no police sympathizer, but as far as I’ve read, this fine, upstanding citizen just cashed the check he wrote himself. What’s worse, his family and the veritable masterminds of OccupyOKC are trying leverage the actual tragedy of an innocent victim (T. Martin) to try and lend this CRIMINAL’s case some validity. But hey, they’re both black, so they are obviously related, right? I would say they should be embarrassed of themselves, but it’s obvious they lack the reasoning faculties to get there on their own. P.S. Sorry to pollute your blog with a comment. If you point a gun at a cop, they will shoot you. I think that’s well understood and not controversial. I don’t think this case is so clear cut; he was shot in the back, for one thing. Witnesses say he had his hands up for another. Just because you break the law doesn’t mean that you deserve to die. If that were the case, we could just not have prisons at all. I would rather not live in a place like that. I agree that it’s somewhat cynical to appropriate the Trayvon Martin case to raise awareness of this one, but I think it was actually two distinct events that got combined into one. I am a journalist trying to get national attention regarding this murder, can you please contact me? What is Dane Scott Jr’s criminal record anyways? When Scott exited the vehicle, he did have a firearm in his hand. ….